Hello, Hello! I don’t know about you, but I could REALLY use a day between Saturday & Sunday- this weekend was jam-packed and I am desperately in need of about 24 hours before diving back into this Monday. Oh well… until I find a magic genie to grant my wish, I’ve got a simple & sweet outfit to kick off the week! One of my favorite designer brands is Kate Spade; her whimsical prints & designs always make me smile and leave me inspired. 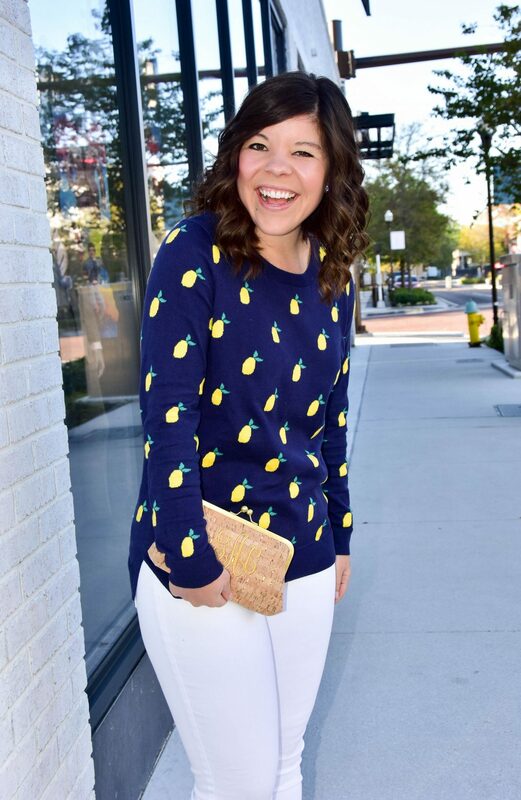 So when I first came across this lemon print sweater it immediately made me think “Kate” but then the price tag said “Gentry’s closet” -ha! I can hardly believe that this cutie rings in under $25!! Bargain of the week y’all! 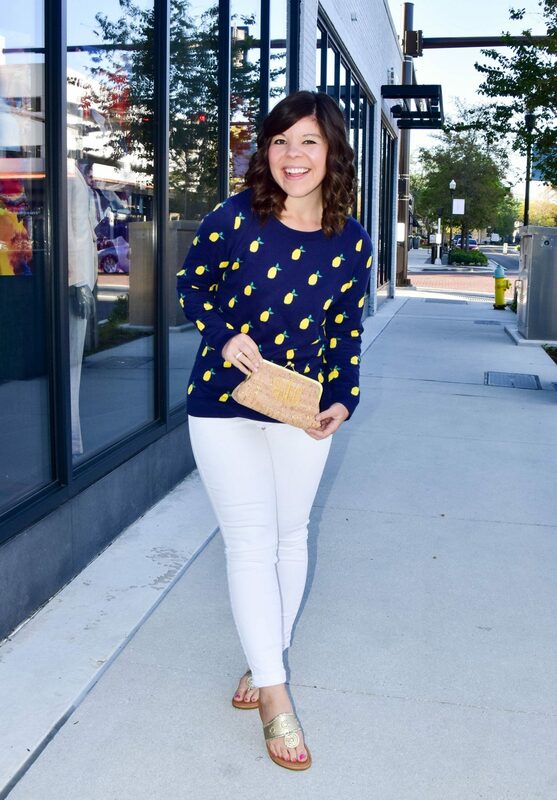 I know so many of you are dreaming of Spring but still battling winter’s lingering chill, so pairing this sweater with white denim makes for a perfect, seasonal-appropriate outfit. 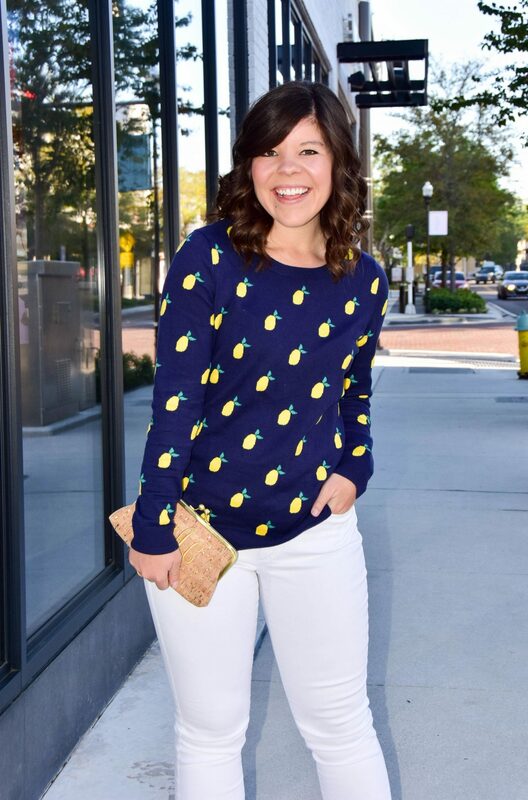 Plus, as I highlighted in this recent post, fruit prints (like this cheerful lemon) are SO in for Spring and I can’t get enough! 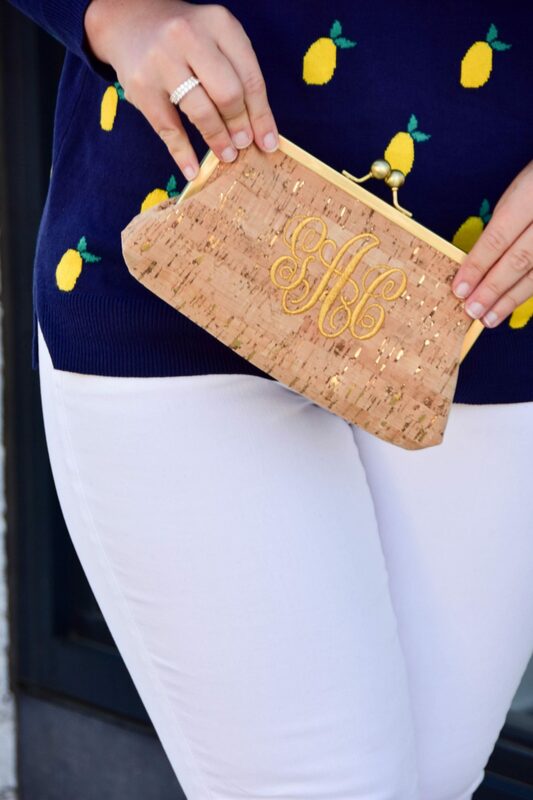 Isn’t this monogrammed clutch the sweetest?! My sweet friend Ashley got it for me for my 30th birthday and I couldn’t love it more! The interior has the most gorgeous, Lillyesque print that I adore. You will definitely be seeing this beauty all season long! Finally, I wanted to let y’all know that I’ve noticed some issues with my blog populating on Bloglovin’ in a timely manner. Last week it was taking 24-48 hours for posts to show up there. I’ve been working with the help team to try and get this fixed, but we can’t figure out what’s going on. So in the meantime, please be patient with me or sign-up to receive email alerts when new posts are live. Thank you! Such an adorable sweater! 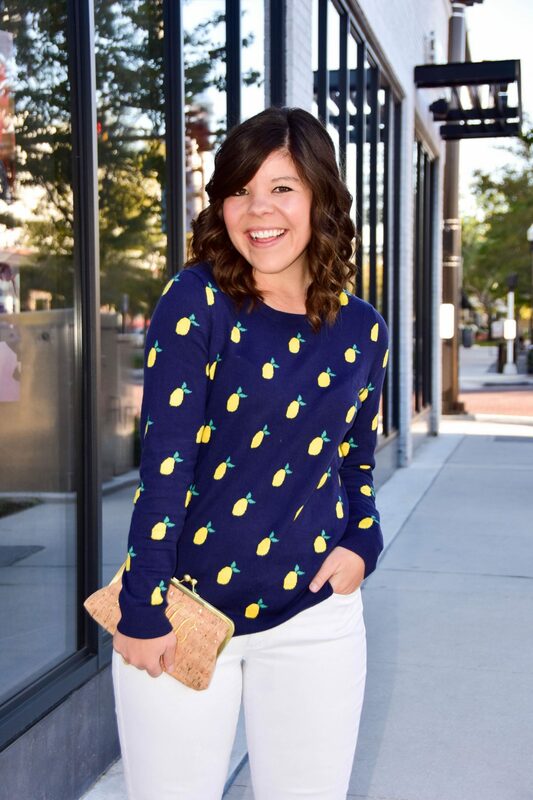 I’m all about the lemon print, it’s so fun for spring and summer! This sweater is number 1 on my wishlist!! I can picture it going through all the seasons very easily. I’ve heard other people have had issues with Bloglovin lately, so it might not be on your end! OK that’s good to know! I’ve been stressing out about it! so cute! my mom just bought this sweater yesterday–I almost bought it too-so cute! You need it too I think!! How cute would y’all be matching? I am not sure how I’ve missed this sweater at ON I was just there and did an online order this week too! Lemons are my go to lately, so adorable! They are too much fun to wear! ON is knocking it out of the park lately! This print is adorable! 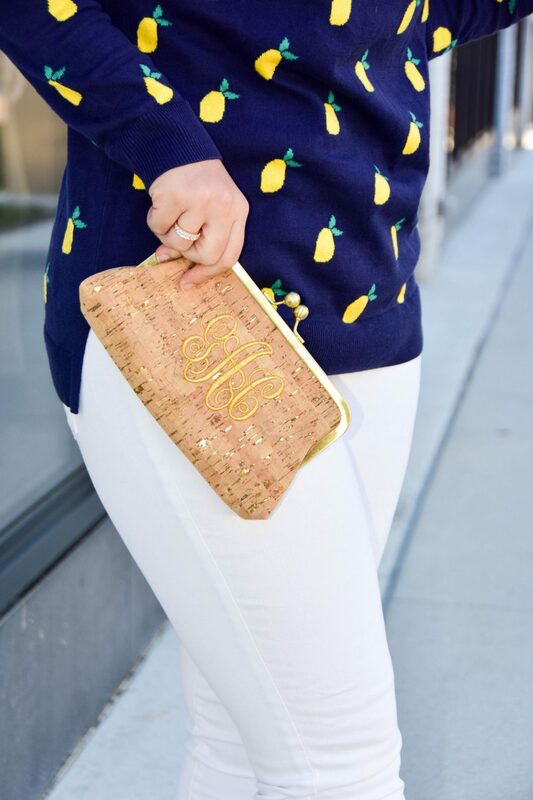 And you’re right…very Kate Spade on a budget! 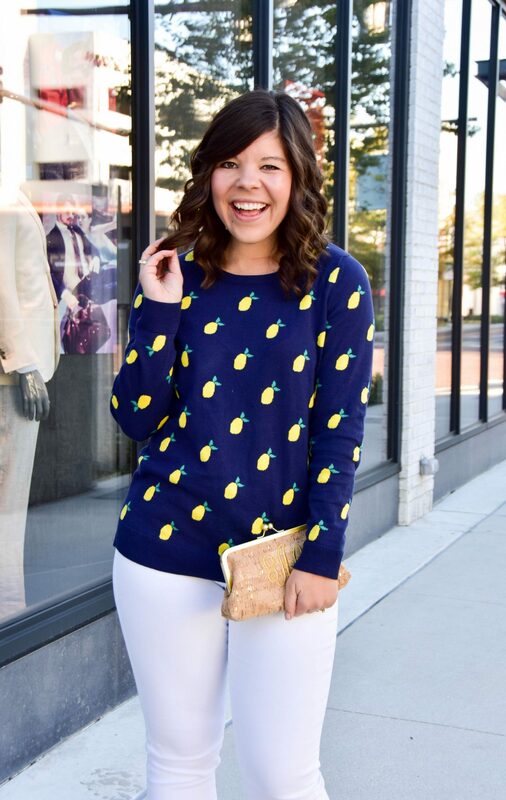 I also really love pineapple prints. I still definitely have a chill here where I live…it snowed the first day of spring 🙁 So I’ll have to take your advice and wear some spring prints for cold weather. What a cute jumper, love it paired with white jeans. Oh I love wearing my white jeans in the winter months, I do have to pick and choose my days thought, can’t wear them I when it’s wet or damp! It sounds like the budget for Gentry’s closet is very similar to the budget on Katie’s closet ;] I LOVE this sweater! It is so cute and so you! This is such a cool sweater ! Nicely worn. Such a cute sweater! Really lovely print for spring. Love the combination of white and blue too. Those vibrant yellow pineapples really pop out of the photo. Such a cute sweater! Really lovely print for spring. Love the combination of white and blue too. Those vibrant yellow lemons really pop out of the photo. I absolutely adore that top! What a fun look for the spring! That is such a cute top! 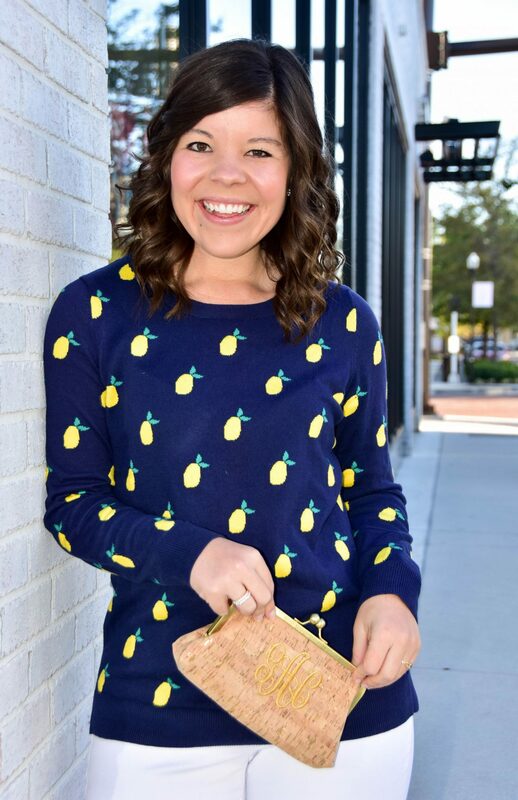 I love that it’s a sweater but with lemons!